A moderately popular blog can be very energy intensive. From energy consumed by the computer (or computers) at the bloggers end, to the server farm where the the blogs files are hosted, to the readers’ computers, a typical blog getting about 15,000 visitors per month generates about 3.5 kilograms (kg) of carbon annually. All this was worked out in a study by Harvard physicist Alexander Wissner-Gross, PhD, who determined that each visit to an average website causes about 0.02 grams of CO2. That doesn’t sound like much, but extrapolate that to the 200 million blogs estimated to currently inhabit the blogosphere, each averaging 15,000 visitors per month (some get a lot more, most probably get much less), and we see that blogs contribute 700,000 tons of carbon to the atmosphere each year! This is one reason why GlobalWarmingisReal has signed onto the new Plant a Tree program sponsored by Ixpo. The initiative gives blogs an opportunity to become a “Carbon Positive Blog” (see the banner in our top sidebar on the right) by planting a tree for each blog that participates and helps spread the word. The UNFCCC estimates that a single tree helps remove about 10 kilograms of CO2 from the atmosphere every year, making an average participating blog carbon positive. 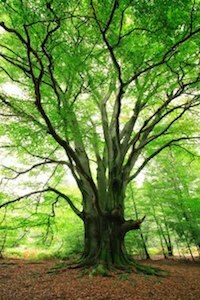 The more blogs that participate, the more trees planted, and the more carbon removed. It’s a small but important step all electronic publishers can take to help minimize their impact. San Bernardino National Forest, the Butler II burn. Plumas National Forest, the Moonlight fire. Huron-Manistee National Forest, Kirtland Warbler nesting habitat restoration. Ocala National Forest, longleaf pine restoration. It is not too late. We are solution-oriented people. We have developed programs that work, which are restoring trees and forests to degraded lands. We are working with individuals, communities, and other organizations around the world with a shared vision for a positive change.